For this year’s Italian Championships we’re back in Darfo Boario, where the 2016 edition was raced. Giacomo Nizzolo proved to be the strongest that day, managing to drop the likes of Brambilla, Caruso, Moscon and an in-form Pozzato. Some changes in the parcours and a stacked parterre des rois will give us another entertaining race. Besides the 6 kilometres of difference between 2016 (227,8) and 2018 (233,8), the parcours has some interesting changes (link to 2016 profile). 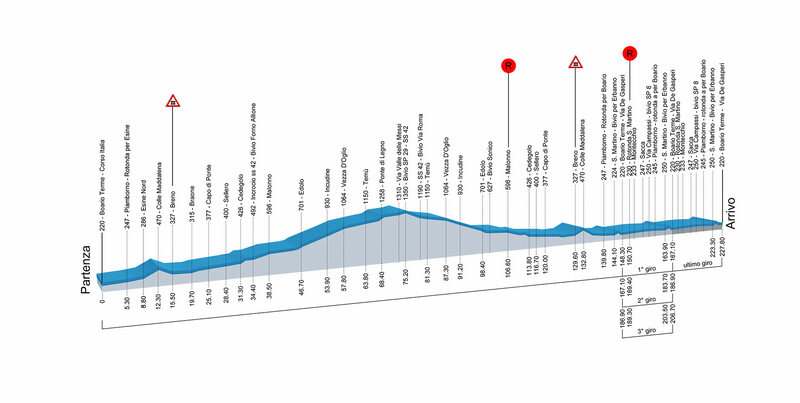 Starting again from Boario Terme, the riders will rapidly enter the first circuit of the race; this will feature a small hill in Gianico, around 1 km at 6,5%, and will end after 4 laps and just over 100 kms of racing, when the second (and last) circuit will start. The second circuit is 33 kilometres long, will be repeated 4 times and features 2 hills: the new entry is the climb to Berzo Inferiore, 5 kms at 3,5%, but with 10% ramps towards the end. The last time the riders will cross Berzo only 15 kilometers and a murito will separate them from the finish line. The previously mentioned (and already well-known) murito is Erbanno (Via Cornaleto): a 500 metres kick at around 11%, with 17-18% peaks in the last 200 metres. The already reduced peloton will tackle the last slope with 4 kms to go. Legs will hurt. The finish line will be on the flat and large road of via Alcide De Gasperi; the last kilometre will feature 4 turns, but none of them will be an issue for the riders. Elia Viviani: thirteen wins already this season, enough said. He’s in the form of his life and will have 3 teammates helping him (Sabatini, Martinelli, Capecchi). He will surely survive the hills, but the last one is a bit too close to the finish line. In 2016 Nizzolo did his best on Via Cornaleto and attacked just after, surprising the others (and himself too, probably). Can Viviani do the same? Sonny Colbrelli: he gets to the Nationals (and the Tour) fresher than last year; the Tricolore should be a massive target for him, form should be there too. He will like the parcours even though he didn’t participate in 2016. Probably one of my favourites for the win. Giacomo Nizzolo: Nizzolo seems to be back to his best (or close to) after some injuries that slowed him down in 2017. He actually still missed the Giro because of the same knee issues but, as past winner, he can’t be overlooked. Will he be able to repeat? Chances are very low, because of both a stronger field and him not being 101%. Andrea Pasqualon: he’s one of the jokers of this year’s edition. The sprinter of Wanty has 4 wins already in 2018 (more than he has in his career before this season – 3) and will go back to the Tour in a week. He’s unknown over the distance and would probably have liked an uphill sprint, but could surprise a few in the end. Gianni Moscon: the Italian time trial champion will be making his Tour de France debut and is poised for a strong Championship. He was 5th in both 2016 and 2017 road races. He was in particular impressive in 2016 when, as a first year as professional, he was probably the strongest on Via Cornaleto. The form should be there and the parcours suits him, but he will also be heavily marked. Diego Ulissi: he rode the Giro in support of the ghost of Aru and was then freed at the Tour de Suisse, where he got a win and some important placings. Ulissi seems on the right path for a great National Championship but he’s always very unpredictable. In 2016 he was the number 1 favourite, coming from an incredible spring and an outstanding Giro, and was nowhere to be seen. This season things seem to be different. He will also have a strong team supporting him, with Conti and Consonni ready to play their cards. Enrico Battaglin: in 2016 his fan club was all over the streets of Darfo, via Cornaleto was dominated by a giant inflatable depicting Battaglin himself (with kit, helmet and everything else). At his annual participation at the Giro, last month, he won a stage and looked incredibly strong and comfortable. The team then sent him to Tour de Suisse. Is his peak condition gone? Looks like it. Parcours isn’t suiting him much, too. He will be one to watch anyway, should the race be harder than expected or the should the final sprint count fewer protagonists than expected. Vincenzo Nibali: last but not least, lo Squalo. Silently but meticulously preparing the Tour, he only let one arrow fly until now, and that was Milan-Sanremo. He could win from different scenarios but a long-range attack is his best bet. Can he surprise us again? Giovanni Visconti, Damiano Caruso, Gianluca Brambilla, Oscar Gatto. Damiano Cunego, last race of his career. 49 wins: 1 Giro, 1 Amstel Gold Race, 3 Lombardia, our hearts and the anger of Gibo Simoni (a win’s a win). 📺 The race will be shown live from 14:30 CET on RaiSport and PMG Sport streams. 📝 Live ticker from @CICDarfoBT and #Tricolore2018. ℹ️ Program and general informations on the official website, here. ⛰️ Climbs details from La Flamme Rouge. © Cover image from Miriam Terruzzi.